When I started the Digital Workshop Center in 2006, I always knew small changes in the way we teach could have a big impact in the classroom. I had been teaching larger classes at professional development centers and community colleges; some live and some online. I always felt that the best way to teach anyone was in small class sizes, so you can show someone hands-on the “right” ways to use these amazing software tools. Small instructor-to-student ratio and great instructors have helped me to build a business around customized classes and personal attention for our students. Last year, I began discussing with members of my staff how the front portion of our current building would be a perfect space to add coworking desks and private offices. We already reside in Old Town, walking distance to the best of the Fort Collins downtown community. We already have the meeting and classroom facilities that others can use. We already have great parking on-site and on the neighborhood streets. The opportunity to create something special presented itself and we took it. I had visited other adult education centers and seen the way that coworking and education can create a fantastic partnership for the students and the community members. 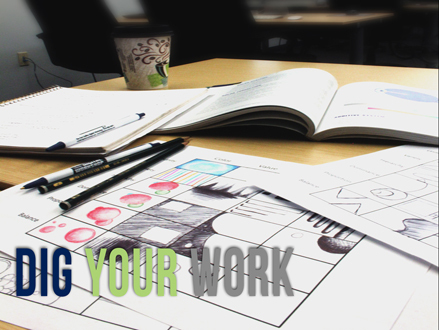 Small business owners who are students in our classes can begin growing their business by using the coworking space. Simultaneously, community members can improve their skills and become more productive remote workers and freelancers. So, in July of this year, we decided to go for it and built a community and coworking center at our Old Town Fort Collins location. We had big plans; but, still wanted to think small. Thinking small is as important in coworking as it is in class size. It doesn’t mean that the business can’t scale and grow to a profitable size, or that we can’t have a big impact on our students lives and surrounding Fort Collins and Northern Colorado communities. By keeping our coworking community small, there is more…community. In only seven weeks since we have opened, our community has become a network of highly motivated local business men and women. Everyone is there to get work done, but casually there are people making connections that might never have happened before. Graphic designers are meeting web designers who need each others’ services. Writers and business consultants are finding ways to team up on future projects. Our students are interning with some of the member companies of the community. It’s an amazing feeling of energy in the building and an incredible community that is building here. Beyond what we are building here at the Digital Workshop Center, there have been some other small changes in the Fort Collins coworking community as a whole that are having a big impact. The addition of national companies such as Galvanize is shining the light on the Fort Collins tech and entrepreneurial communities. With a larger chain company moving in, many have asked me, ‘what do you think is the difference between the DWC and Galvanize?”. 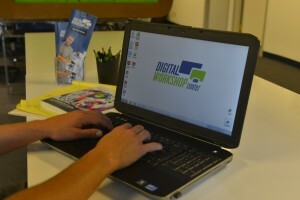 I see the DWC’s role in the Fort Collins coworking community as a first-step for any small business owner. More of a ‘locals’ option. Built for Fort Collins local business owners and geared towards those whose small business is in the first stages. When someone sees an opportunity for their business to grow beyond local, I think a great, logical next step from our coworking community is to consider a larger facility. There is definitely room in this community for the DWC and much more. While there are some similarities with the DWC and larger competitors, we are also proud of our distinct differences. The DWC currently offers over 45 different software programs and we cover a wide array of necessary business skills: graphic design, web design, and business applications. We’ve built our reputation in Northern Colorado over the last nine years based on training in our own, unique way and creating that small, local feel that keeps the “human” experience alive in a technology classroom. Coworking is a part of the new, shared economy, following trends that have been seen in car sharing services (i.e. Uber, Lyft), hotel rooms (i.e. Air BnB), and so much more. It is a shift in the way that people use space, and how a small business can become part of a larger community like never before. If you are ready to move out of your home office or want to try a new way of working, we would love to have you come try our space for 7 days. See if it is a good fit for you and we hope to have you join us as part of our small community doing big things. 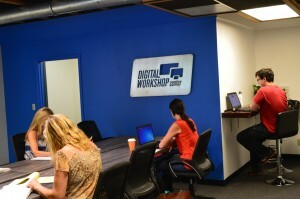 If you are interested in learning more about coworking in Fort Collins at the Digital Workshop Center, fill out the form below and contact us for more information. Fill out the form below to request more information about Coworking changes the way business happens in Fort Collins or to request information on customized individual or group training sessions.